Our road warrior puts 5 noise-canceling headphones to the test. There isn't a lot of silence in my job. As the founder and CEO of MindTouch, an enterprise software company based in sunny San Diego, I fly about once a week for meetings and speaking engagements. I often spot fellow road warriors wearing headphones that play audio and also broadcast a white noise signal at the same frequency as nearby sounds, canceling out most of them. (If it works, you're not supposed to hear the white noise.) Many of my employees also enjoy the quiet these headphones confer in the office. 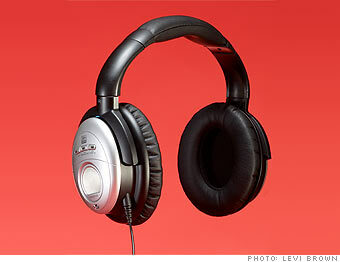 But noise-canceling headphones skew bulky and expensive, particularly when compared with the low-cost earbuds that come with most smartphones and MP3 players. After I plugged five of the latest noise-canceling headphones into my iPhone over three weeks, my opinion of this gadget category changed -- but just barely. The first headset I tried was the Creative Aurvana X-Fi ($300). I flipped the power switch and was filled with a sense of peace as the clattering of keyboards and the obnoxious whirring of my office's HVAC faded away. The design was the most appealing and impressive of all five headphone sets mostly because of the futuristic control buttons. That's no small feat, considering that competitors Bose and Sennheiser are both famous for their sleek designs. The Creative Aurvana features a complicated control panel adorned with glowing buttons and inscrutable acronyms. Younger or geekier users might find this appealing, but I played with the controls and didn't notice a significant difference in sound. One of my audiophile co-workers swore he detected white noise, but I did not, nor did others I tasked with detecting the noise.